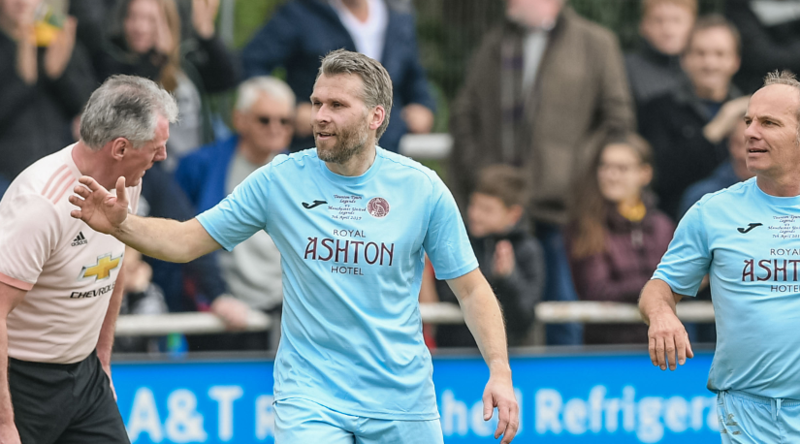 More than 2100 fans, with some coming from as far away as Gloucester, Cornwall and the Midlands filled the Viridor Stadium on Sunday afternoon to watch the Manchester United Legends take on a Taunton Town legends team. The Manchester United legends team which included Keith Gillespie, Chris Eagles, Sammy McIlroy and Lee Martin were an impressive side, with the match ending in an entertaining 3-3 draw, with a final goal for the visitors coming in the final seconds of the match. Whilst in Taunton, the Manchester United legends players enjoyed the hospitality of the recently refurbished Royal Ashton Hotel. The hotel was the major sponsor of the match. Taunton town supporters were delighted to see some of their old Taunton Town favourites back on the Taunton town pitch including Paul West, Andy Perrett and Owen Irish. Both teams chatted to fans after the game, posed for photos and signed autographs, making it a very memorable day for everyone.